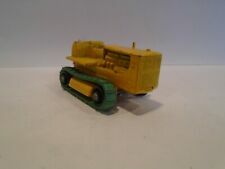 Lesney Matchbox No 18 Caterpiller Bulldozer - Made In England - Boxed. Original in original box. The truck is a deep aqua blue with a black Sagamore tampo on a white plastic container and a gray plastic base. A rare find and with the original box. 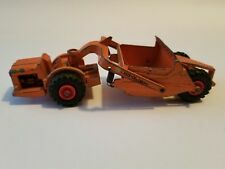 Bottom of trailer is marked "Matchbox, Super Kings, K-18 Articulated Tipper Truck, Made in England, (c) 1973, Lesney Products & Co., Ltd.". MATCHBOX - LESNEY. HARD TO FIND WITH THIS CAB! Trailer has opening door, tipping box & drop down wheels. A-1A-1 Esso Gas Pumps Matchbox Plastic Copy Hong Kong Blue-Box Mint! This toy was made in Hong Kong by Blue-Box. There are in pretty good used condition. I would call It about a C5. Shows some signs of playware and age ie paint loss scrapes etc. Wheels are a little loose as they get on these type of matchbox cars Best described by photos provided. Visit my ebay store for more great vintage collectibles and add us to your followed sellers, we are adding new items daily!! #32 MBX (Bobcat®) Skidster™ (S100). 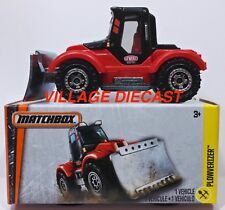 2019 Matchbox. Front loader "works" Tractor Articulates in Middle. Lots of FUN! NO EXCEPTIONS. FOR USA ONLY. 1971 Lesney Matchbox Superkings Scammell Contractor BEST COLOR SUPERB CONDITION! We are not expert’s, just speculators. We will always keep an open line of communication with you and give you updates as to the status of your item. We show you all sides of the item and describe it to the best of our ability. It is in EXCELLENT Shape with maybe a fleebite or two and a blemish in the dump bed. - I will describe to the best of my ability each item with honesty. FWD57 1:64 Scale Diecast. MBX Service. MBX Crane Construction. Matchbox 2018 Working Rigs. Matchbox Real Working Rigs. 1:64 Scale. M4 Ruston Bucyrus. PIC IS FOR SHOW. CHECK OUT OTHER TIRES AND PARTS. All of Our eBay Listings: http://stores.ebay.com/thetreasurechesttoys About Us: The Treasure Chest Toys LLC is a company that is passionate about toys and trains. We are also passionate about what we do. What is it we do? Sell toys and trains? Yes, but we don't just sell toys and Trains. We live them. We love them. And, just like you, we collect them. Combined Shipping: We do allow for combined shipping. Simply wait to pay until you are finished with the auctions and contact us to let us know you are ready for an invoice. We simply ask that you have your items paid for by the end of the weekend. Return policy: We offer a 30 day money back return policy. LESNEY ENGLAND. WHEEL CRANE. MATCHBOX SERIES NO. 30. Lesney Matchbox Taylor Jumbo crane, King size series 14. Nice condition, has one non original tire (correct size and pattern, blank sidewall). SOLD AS IS. 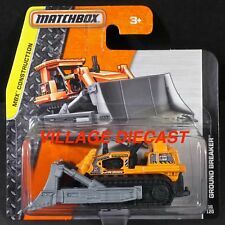 2017 Matchbox. #41 All-Terrain Crane™. with aYELLOW crane, "INC CONSTRUCTION" tampos. and oversize LIGHT GREY dual-ringed eight-dot wheels. Done out in classic Construction Yellow gloss finish.This is a solid diecast design with a plastic bucket and arms - that you can move! (They won't have this! UNIQUE custom piece!). Custom Made -. FREE Trial ! This is a solid diecast Cab mixer tank w/ other mixed plastic and diecast parts. This is JUST like the real thing! w/ incredibly realistic features and details! Fully Articulated, Operational w/ moving Mixer Tank real rubber tires on wheels that move! Matchbox #43 Camaro Z-28 " '95 Premium Show" near mint RARE!!! This is #43 Camaro Z28 orange and yellow with " '95 Premium Show and Get in the Fast Lane" logo. Made in Thailand. This one is rare! Car is mint. 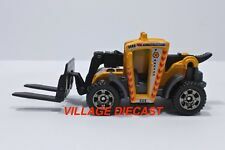 You will receive 4 Used Matchbox 2006 Plastic Dump Truck,Bulldozer,Cement Truck and Garbage truck With Sounds By Mattel (one of these items needs new batterie old batteries have been removed) items work fine they have very little wear from play Refer to the photos for a look at the actual items you will receive. VERY HARD TO FIND WITH THIS CAB The cab has a BLACK square in front and the exhaust stacks on back are silver in color. There are other cabs that look similar but have different stack & front square colors. I showed the similar cab in last photo. (NOT INCLUDED IN THIS SALE) Shows signs of playware and age. Dozer is missing a track. Best described by photos provided. Visit my ebay store for more great vintage collectibles and add us to your followed sellers, we are adding new items daily! The item is in good pre-owned condition. Images show the exact item you will receive. We apologize in advance for this inconvenience. For sale is a Lensey Matchbox truck #15. This matchbox is 2 1/8" long. The overall condition is good. You are looking at a pre-owned Matchbox Dinosaur Hunters. This one features a white gloss finished cab and the classic green refuse box just like on their real trucks! Garbage / Refuse Truck. (They won't have this! ONE OF A KIND!). I may have just what you want, and can customize it just for you! NOTE - the mixer does not rotate when moving the vehicle so the gearing is not engaging! ~~ WARRANTY ~~.